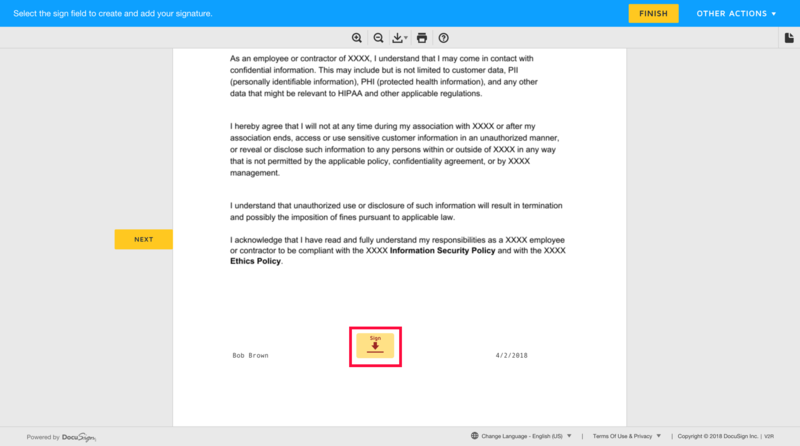 Docusign offers an electronic signature system for files stored online. The Docusign connector allows you to use DocuSign electronic signature features directly from an AODocs workflow. 1. Open your AODocs document. 2. Enter the name and email of the signees in the property fields. 3. Create, upload or import the attachment to be signed. Tip: You can configure an AODocs template as a default attachment. - The following file types are supported by the AODocs-DocuSign connector: PDF, Microsoft Word .docx and Google Docs. - If you attach several attachments to your document, DocuSign will send only the first attachment of a supported format for signature. 4. The attached file must contain anchors. 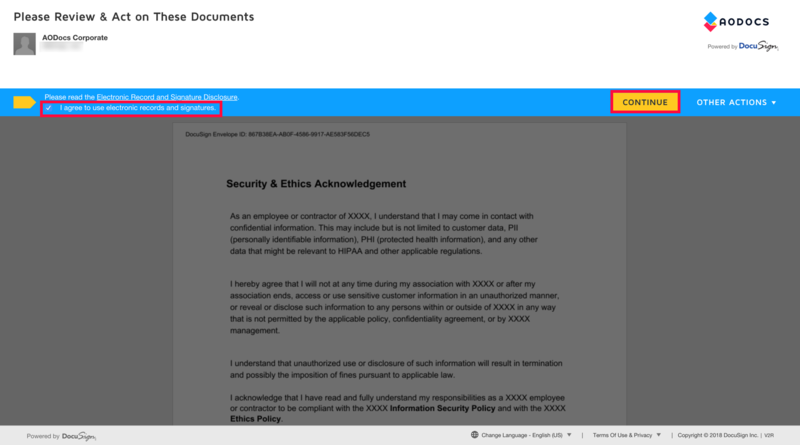 DocuSign uses these anchors to identify where to add the signee’s name, the signature and the date of signature on the file. Tips: You can hide these anchors by putting them in the same color as the background of your document. 5. Once you are ready to send the document for signature, press the Workflow action icon and select Request signature and validate your action. AODocs sends your attached file to the DocuSign platform. DocuSign issues an email notification to the signees you specified in the properties, inviting them to review and sign the attached file. 6. Reload the document page. The workflow state has moved to Awaiting Signature. The properties Sign status and Status reason are automatically filled in and indicate that the attachment has been sent and delivered to the signees. 1. 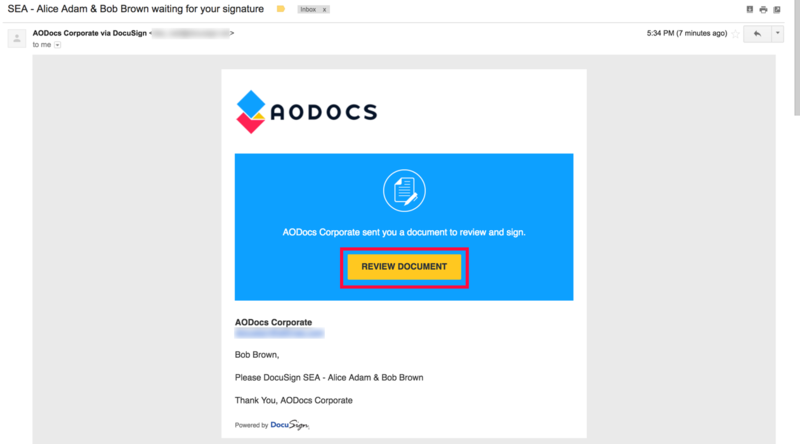 Open the DocuSign notification you received and press Review document. 3. Review the file and press Sign if you agree. Note: The anchors are replaced with the signee’s name and the signature date. 4. Customize your signature and press Adopt and Sign. 5. Press Finish to confirm your signature. Other actions > Decline to Sign: reject the signature. The document will be marked as declined in AODocs. Other actions > Assign to Someone Else: delegate the file signature to someone else by giving an alternative name and email address. - After assigning to someone else, you can can no longer view or sign the file. - Replacing a signee in DocuSign doesn’t update the signee set up in AODocs on the document properties. 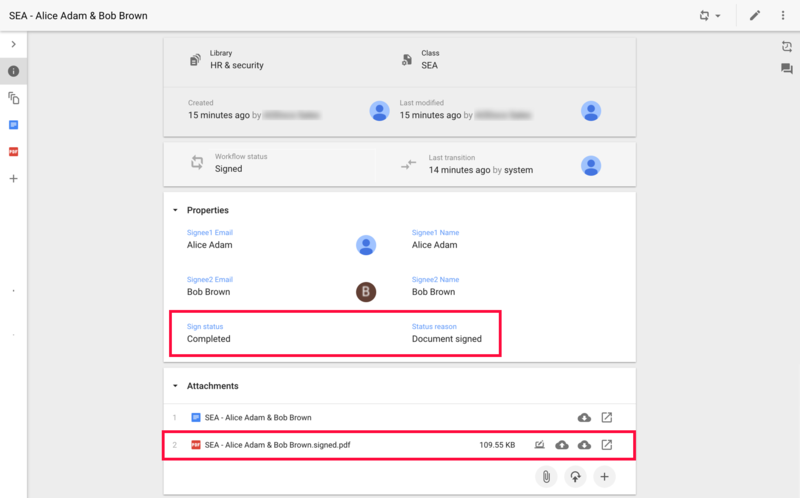 As a user who has been added to a DocuSign account, DocuSign lets you cancel a signature by voiding an envelope if the document hasn’t yet been signed by all signees. DocuSign sends an email to all the signees when you void an envelope. The signees can no longer view or sign the file on the DocuSign platform. DocuSign communicates progress of the signature process to AODocs. 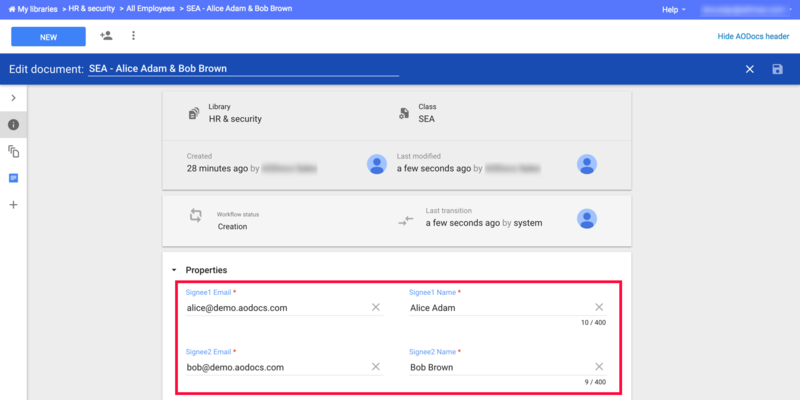 AODocs automatically updates the property Sign status in the document according to the information sent by DocuSign. When the last signee signs the file, the file is converted to a PDF by DocuSign and the signed PDF file is added to the AODocs document as an attachment. The Sign status property is changed to Completed and the Status reason to Document signed. The DocuSign sender and the other signees receive a notification from DocuSign. On the document page in AODocs, the Sign status document property changes to Declined. The Status reason property indicates the email address of the signee who declined to sign. The DocuSign sender can cancel a file sent for signature. The DocuSign sender and the other signees receive a notification from DocuSign. On the document page in AODocs, the Sign status document property changes to Voided. The Status reason property will indicate the reason the sender can enter when cancelling the signature. AODocs changes the Sign status to Error. The specified Anchor Tab string was not found in the document. Anchor Tab String "#sigDate1" not found. The document is missing one or more of the anchors defined in section Prepare a document for e-signature. The UserID does not have a valid membership in this account. You don’t have a DocuSign account linked to your organization. Contact your library administrator. What is the DocuSign integration?